Bold Rectangular Link Fashion Bracelet in 14K Two Tone Gold . 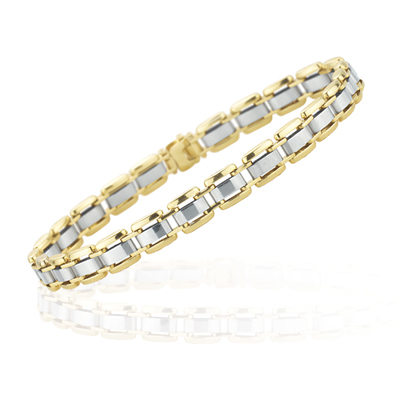 This dazzling Fashion Bracelet is ornamented in 14K White and Yellow Gold. The bracelet measures 0.26 mm in width and 7.75 inches in length. A splendid bracelet to compliment both casual and formal wears. This bracelet is offered at an exceptional value and only one is available to be sold.